With full-color photos. "Facts, experiments, tricks based on scientific principles, and things to make comprise the text of this book. The material is divided into four sections--water, air, movement, and light. The language used is clear, concise, and interesting. 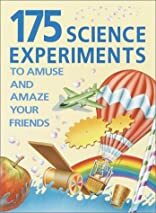 Every experiment, trick, and object to make is not only explained clearly but illustrated as well, making the book especially useful for the visual learner. There is so much here to intrigue readers! This will surely bring young readers into the interesting world of science." --(starred) Science Books & Films.